White asparagus steamed is a quick and easy vegan recipe that takes only 10 minutes to prepare and cooks in about 5 to 10 minutes in the microwave oven. Every spring, we find asparagus on sale in the supermarkets in our town and in the surrounding communities where we shop. 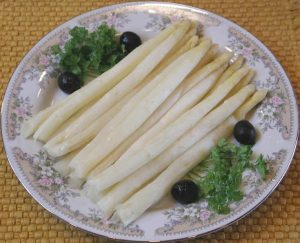 They have large displays of rubber banded bunches of about 1 pound each standing in aluminum or plastic pans containing about a half inch of water to keep the spears fresh, and when they have white asparagus, they are right along side of the green. We believe that white asparagus steamed is more of a novelty vegetable than the green asparagus, because it most likely has less nutritional value due to the lack of color, but it is still very tasty. Before removing the rubber bands, cut off the bottom 1/2 inch of the spears. Then the rubber bands are removed and the spears are soaked in a sink of cold water while the cleaning process continues. Individually inspect each spear and remove any dirt or sand that remains. Place the spears in a vegetable steamer or in a covered microwave baking dish. Cooking time is generally about 5 minutes per pound in a microwave set on “high”. Cook until tender (as pictured above). If the spears get long creases they are being overcooked. Enjoy! We enjoy asparagus as a main course served with a salad, or as a side dish.